I hope you have yummy treats without the tricks this year. This was a perfect book to read this time of year. A little spooky--but not too bad (for me--not going to hand it to my kids!) If you want a quick, seasonal read, give this one a try! 3 stars: Imaginative and creepy. Zach is 12 and still plays make-believe games with Poppy and Alice, even though most people would say he's too old. "Most people" meaning his dad, any kid at middle school, and Poppy's older brothers, to name a few. Their complex made-up world is populated by action figure and doll characters. The doll they've dubbed the Queen is a bone china doll inside Poppy's house, locked in a cabinet. Apparently, the doll is worth a lot of money and must not be removed on pain of death. Not that they've ever really wanted to take her out. She's kind of creepy. So when Poppy comes to get Zach (with Alice) in the middle of the night on an urgent mission, he's not sure what to think. 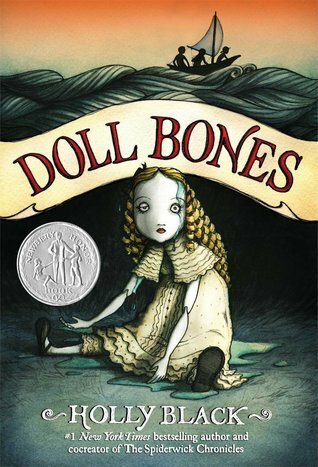 Poppy has the doll with her and claims that not only is it filled with human ashes, she dreamed about the girl whose ashes they are. The girl wants to be buried properly [or else!] The problem is that the graveyard [she says] she belongs in is in East Lancaster, Ohio. It's attainable--by bus--but of course none of the parental figures would be pleased to let the kids go. An adventure begins. There's a lot going on in this book. Each of the 3 friends has less than ideal family situations that they're dealing with. Poppy's older siblings are basically the town hooligans and her parents have given up on them and the house. Alice lives with her grandmother who is extra strict. Zach has both parents at home, but his dad has only been back for a few months, after walking out 3 years before. So there's a lot of built-up resentment and challenges there. Black did a good job making the adventure seem plausible. The town they're trying to get to was close enough to be possible, but far enough to make it difficult. The troubles they ran into also seemed realistic. A couple of their solutions...well, were a bit of a stretch, but still within the realm of possibility. She also did a good job building up the ghost story side of it. Details here and there--the doll moving from where they put it last, dreams from the dead girl's perspective, various minor characters talking like she's real and right there with them, etc. Yep, this book would have freaked me out had I read it as a kid. On that note, I don't plan to give it to any of my children either. They're a lot like me in that regard. I can see why it won a Newberry Honor. It was very well written. I have never liked ghost stories very much, so 3 stars was about all I could give it. As far as scare factor, I would say it was about on par with The Night Gardener, by Jonathan Auxier. Content: One super creepy doll and all that follows. Middle grade level--not recommended for sensitive or easily scared readers. Have you read this one? Does this cover give you the shivers? It does me. I'm glad I just borrowed it from the library--this is not one I would want on my home bookshelf! If you're looking for some not-so-scary books to read this month, I recommend this list from last year: Mini Theme: Halloween-ish Books.